Today, my best friend of 16 years, turns 25!!!!!! We’re big believers of Toots Titts tradition and one of it is to always be together at the midnight of each other’s birthdays. So here I am writing this as she snores away. 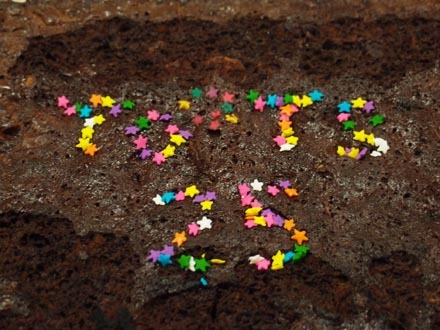 Toots is officially a quarter century today so I thought I’d do a special thing for her. Something that’s so rare it’ll blow her mind away. I baked her a cake. “Ummm… we were just about to buy her cake. So don’t have to buy?” Waa, Toot’s elder sister. I’ll show em. Rolled up my sleeves, posture straight, and confidently I got to work. I was so excited. Chocolate brownies for Toots. I thought to add more crunch, I’d add some Cornflakes too. I also saw some leftover Coco Crunch, but I thought that’s a bit too out there, so I stuck with Cornflakes. 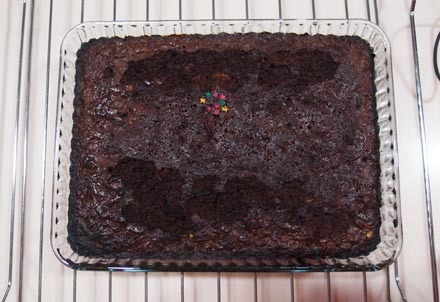 Right before I put the tray in the oven, I gave one look at the future Brownie of The Year and thought hmmm it looks a bit lonely. 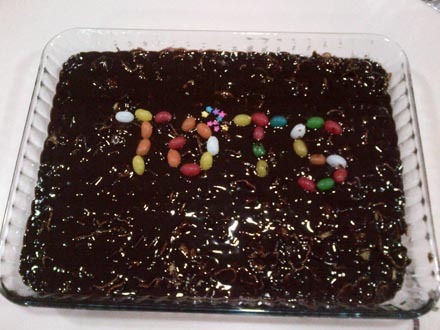 So to spice things up, I added a few jelly beans and wrote TOOTS. Ran out of jelly beans. Found some star sprinkles at the back of the fridge (didn’t even bother checking the expiry date) and wrote a “squared” after the O to make the 2 O’s. People will get it, I’m sure. No one got it. Sigh. People can be so annoying sometimes. 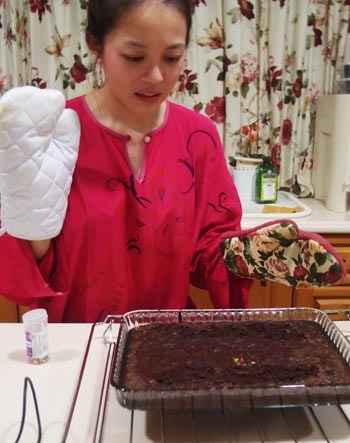 After I put the tray into the oven, the whole house smelled like chocolate brownies. It was so heavenly! I went up, put some good music on, showered and got dressed to go to her house (by getting dress, I meant my sleeping kaftan… it was midnight after all). Came down, and I was smiling as I wore the oven mitts to take the tray out. WHAT THE HELL, WHERE DID THE JELLY BEANS GO?!! Now it’s just an awkward 2. (To others, it’s just an awkward shape). Seriously, go study far far also no point if you’ve got no common sense. Jelly beans + heat = no jelly beans. I had to go with plan B. Thank god I had some more of the maybe expired sugar stars. I was beaming when I presented it to Toots, only to get a laugh from her. And when she tried cutting it, it was as hard as rock. Oh well, guess I won’t be auditioning for Cake Boss anytime soon. so cute! toot is a lucky girl to have a friend like u! hahahahahahahaha i laughed till i cried! u r so funny! hahahahahahahaha! 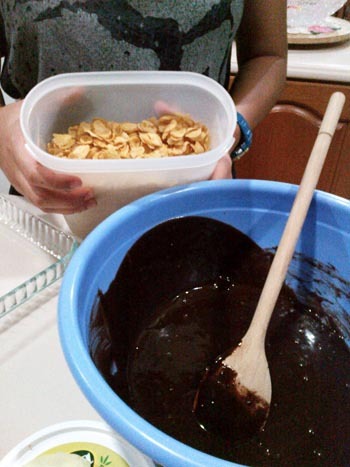 MCM MN LEH TERPIKIR NAK SUSUN JELLY BEAN RIGHT BEFORE U BAKE THE CAKE!!??? 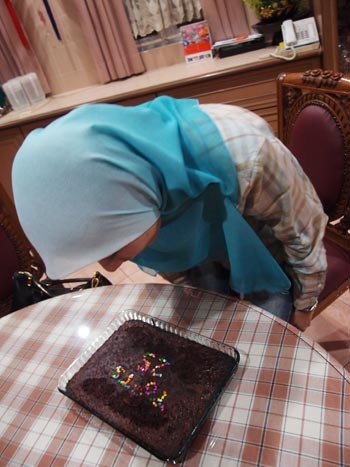 haha..so comel 😉 the effort yang penting, happy b’day toots! i was laughing sooo hard reading this entry !but i have to give you a pat at the back for trying.. HAHAHAH!! 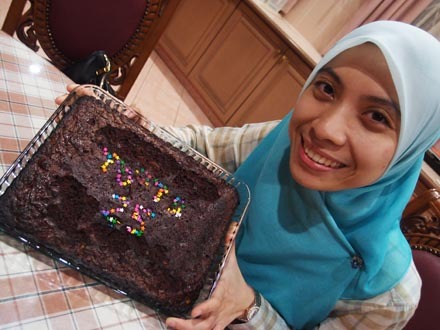 Was laughing sorang2 in my cubicle at the office…sure seemed gila to the others..
Nice effort tho…Toots, Happy Birthday! hehe Vivy, I can’t stop laughing! I just realized, you’re both my prefects when I was in primary 1 @ SKBD! well I remembered you were in charged of my class 1 Merah! All of her cakes, foods… Makes you wanna bake n cook too. Hehehe. 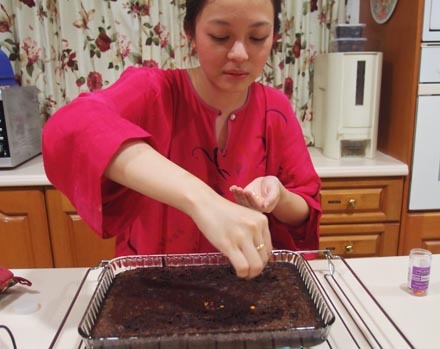 Anyway, your brownies looks comel laa. Happy birthday to your friend, TOOTS! hey, at least you tried! as for me, a no no at all. tak reti buat aje tak reti. anyways, happy b’day toots! HAHAHHA!!! I LOL-ed so hard looking at ur priceless expression up there!!! nahh no worries..I’ve done silly things in the kitchen all the times! LOLOLOLS! That disgust look in pic #4 is really priceless. Ha ha. Kudos to the snapper. Happy 25th Toots! we put decorations after we bake the cake not before… oven heat will melt the jelly beans.. btw so sweet of you doing this to your friends..
anyway,nice effort vivy & Happy birthday toots!!! Hahahaha hilarious! I force my mom to read this so that she’ll laugh as much as i did! ah the “green” bakers… so sweet :).. This was quite funny. Thanks for the laugh. Did it taste good??? Cuz that’s all that matters plus the thought of actually baking something for Toots, of course. Happy Birthday, Toots! Bet it was memorable! sejuk tgk muka toots since donning the hijab. it’s ok vivy. one step at a time! Ahahaha… U r so comel la!